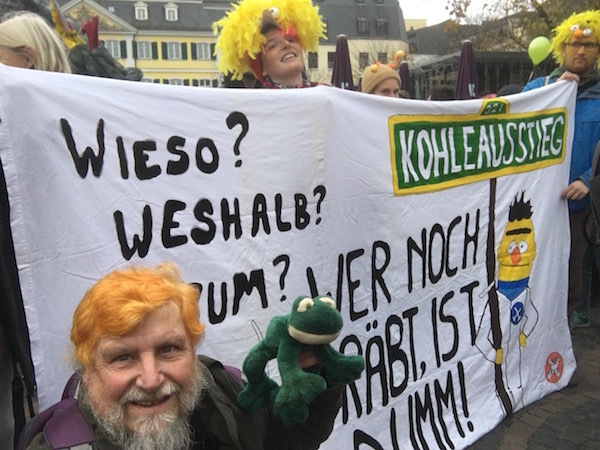 In the immediate vicinity of the latest UN climate change conference COP23 and the largest lignite mining area of Europe, twenty five thousand people demonstrated for the immediate implementation of the Paris Climate Agreement in the city of Bonn, Germany, calling for climate justice and an end to coal. Just ahead of the 23rd World UN Climate Conference (COP23) a broad alliance of civil society groups made clear that the Paris climate agreement needs to be followed by further action to phase out fossil fuels such as coal. More than 100 climate, environmental and development organisations, citizen initiatives and churches from all over world supported the march and the call to action. The regulars were at the march: including young communists from Belgium who were a very vocal and colourful group calling for system change. Die Grunen, Greenpeace, and Friends of the Earth were also there in abundance. I saw a banner for Germanwatch NGO (they do some powerful climate policy research and writing much in English) But there were also thousands of ordinary folk from Bonn and further afield who came to say it's long past time for action on climate change. Somewhere between 800 and 1000 people participated in a cycling critical mass to attend the protest. I spoke to a person, originally from Manchester but currently living in Belgium, who had cycled to the event. Though predominantly German and European, it had a fair share of internationals like myself attending, and speeches from the stage were in Deutsch and English. There were some powerful speakers in both languages. Marshallese poet Kathy Jetnil-Kijiner recited one of her famous poems from the stage at the end rally. There were also activists with a soup kitchen feeding people hot food. The Climate March sends a strong signal to the world’s leaders to take rapid action on fossil fuels and to step out of coal. Without further action, the world is on track for dangerous global warming. The lives and livelihoods of millions of people are under threat, entire island states are in danger of disappearing from rising sea-levels. Only decisive and rapid action in all countries can deliver a safe climate for all. Tackling climate change means a rapid phase out of fossil fuels, including the burning of coal and sufficient support for poor countries suffering from the impacts of climate change. Globally, a third of oil reserves, half of gas reserves and over 80 per cent of current coal reserves should remain under the ground in order to stay below 2°C, according to Ekins and McGlade (2015) See my 2015 article: 95 percent of Australian coal, 88 percent of Global Fossil Fuel reserves need to remain unburned - Implications for Queensland. Coal has no future and is already in structural decline. All over the world, renewables are rapidly expanding, being cleaner and cheaper than fossil fuels. To date, six countries, states, provinces or cities have completely phased out coal power since 2014, and an additional 17 have announced a coal power phase-out date of 2030 or sooner, advises Greenpeace. Our governments need to stop financing coal and fossil fuels and take concrete actions to foster the transition to a 100% renewable energy future. This is the only way we'll keep global warming below 1.5c. We need clean energy systems in the hands of people and a just transition which ensures no one is left behind. Coal workers and their communities are already in steep decline. They need strong support, now, to build new lives with clean renewable jobs and other economic opportunities.